The 50-mile cycling event celebrates Bear Mountain State Park’s 100-year anniversary in a once-in-a-lifetime experience on May 18, 2014 as part of Campagnolo Gran Fondo New York. 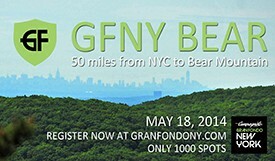 Gran Fondo New York, Inc. adds GFNY BEAR to its prestigious Campagnolo Gran Fondo New York 100 mile cycling race. On May 18, 2014, 1000 cyclists will have the unique opportunity to ride from New York City to Bear Mountain on a 50-mile course that is closed to traffic or has police-moderated traffic. The event will only be held in 2014, and will celebrate the 100th anniversary of Bear Mountain State Park. Bear Mountain State Park is home to Bear Mountain, the highest peak in the vicinity of New York City. Bear Mountain is also the Cima Coppi and featured climb of Campagnolo Gran Fondo New York. Cyclists will get the unique experience to ride from New York City’s closed-to-cars George Washington Bridge, along the scenic Hudson River Valley with its beautiful nature and charming towns, and finish at the 1284ft elevation of Bear Mountain. After reaching the top, the cyclists will enjoy refreshments and receive a finisher medal. At the base of Bear Mountain, busses and trucks will transport the cyclists to the Campagnolo Gran Fondo New York finish area festivities. Campagnolo Gran Fondo New York is the marathon for cyclists. It is among the few Gran Fondos in North America that provide a platform for the riders to challenge themselves on a 100-mile course without having to stop at any intersections by hiring 250 police officers to moderate traffic. Over 300 course signs and abundant road markings provide a cue-sheet-free ride along the entire 100-mile route. Participants traveling to NYC from over 70 countries make Campagnolo Gran Fondo New York the most international cycling event in the world. Campagnolo Gran Fondo New York brings Italian cycling culture to the world’s greatest city. On May 18, 2014, 6,000 cyclists from over 70 countries and all US states will take on a challenging 100-mile route from NYC to Bear Mountain and back to compete against each other, the clock and themselves in a personal endurance challenge. Gran Fondo racing stems from Italy, where these amateur cycling races take place nearly every weekend throughout Italy giving the cyclists a chance to test and prove themselves on two wheels. Gran Fondo New York raises funds for Operation Smile, the international children’s medical charity.